Semiotext(e) has a long history of bringing radical, sick sometimes marginal Francophone thinkers to an English-speaking audience. Utopie: Texts and Projects is a new anthology of writings, look projects, sale and reproductions from the publication Utopie. The Paris-based publication ran between 1967 and 1978, during what was rapidly transformative period in the 20th Century. The works featured in Utopie are situated as part of a larger international dialogue that was happening between radical thinkers, artists, and architects during this tumultuous era. From the publications first issue it is immediately obvious that there are parallels between Utopie and their fellow radical group, The Situationist International. There are also striking similarities between the style of the earliest issues of Utopie and the visual aesthetic of avant-gardes like the S.I., Archigram (UK), or the Metabolists (Japan). The Utopie collective formed in 1967 at the Universitie Paris X-Nanterre which at the time was becoming the hotbed of student revolt. Utopie’s core members included Henri Lefebvre, Herbert Tonka, Jean Aubert, Jean-Paul Jungmann, Antoine Stinco, Isabelle Auricoste, Catherine Cot, Rene Lourau, and Jean Baudrillard. With the exception of Lefebvre himself, and Jean Baudrillard, many of them never made a name for themselves in the English-speaking world. The combination of academics (Lefevre, Tonka, Lourau, and Baudrillard) and architects (Aubert, Jungmann, Stinco, and Auricoste) created a diversity of ideas and conflicts within the group, but its intellectual strength lay in its heterogeneity. Their publication was often distributed in the professional circles of which they were simultaneously participating in and savagely attacking. Utopie represents a critical and sustained engagement with the question of the city. Unlike the Situationists, whose focus on the city dissipated into a quest to radically change the experience of daily life, Utopie’s members were directly involved in the inner workings of the city. Thus their perspectives focused on more in-depth problems specific to architecture or urban planning. Utopie’s critique is radical but it is a radical insider critique rather than one from outsiders—the would-be technicians trying to dismantle the system from within. Aesthetically speaking, Utopie descended quite directly from the lineage of Archigram and the Situationist International. The publication itself had interesting design elements with prolific use of collage, comics, slogans, sidebars, and marginalia. 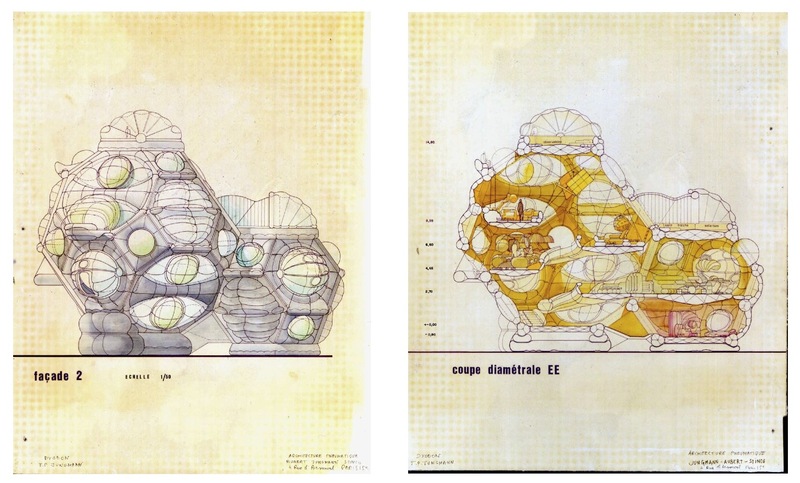 Utopie was in early stages quite obsessed with inflatable and temporary architecture and even featured a lot of Archigram’s work in its pages. Comics and commentary were scattered throughout each issue. As the collective members changed and shifted, there was less emphasis on the visual components in later issues of the publication. Intellectually, the collective directly benefited from Henri Lefebvre’s influence. Lefebvre loomed large in academic discourse and was directly involved with radical groups by the time of Utopie’s formation. The academic half of the Utopie collective were Lefebvre’s teaching assistants The group’s writings, following from Lefebvre’s influence were heavily Marxist, directly addressing certain fellow Marxist positions and expanding a (heterogeneous) Marxist critique of urbanism. Lefebvre’s only attributed contribution to Utopie is a long article about the need and problematic nature of “urban” as a distinct field of study.1 He proposes a school dedicated to urban studies which at the time of his writing was not yet a discipline. He ruminates on the need for scholars to understand the urban and that the only way to study the urban environment is through interdisciplinary research methods. But he notes that it is a challenge because the “urban” itself is conceptually diffuse it is therefore resists definition. Lefebvre’s intellectual influence is prominent in the earlier issues and then falls away as the group moves toward Jean Baudrillard’s emerging critique and break with Marxism. DYODON – UNE HABITATION PNEUMATIQUE EXPERIMENTALE juin 1967, 2ème version. namely that there is an inherent complicity of architects and urbanists within Capital’s urban project. They often place “urban” and “urbanism” in scare quotes to reveal the ideologies behind of the terms. Utopie takes professional urbanists to task stating that, “The absence of a radical critique of society by the “urbanistic” approach makes urbanism a direct “accomplice” of this social order.”2 The rest of the “Logic of Urbanism” dives further into how the urban form perpetuates itself, serving to spread both development and the social relations that support it. The biggest problem identified with urbanism (meaning urban-planning in this instance) is that it seeks to systematize urban reality. Utopie critiques the urbanists idea of participation3 which for urbanists means meetings between various “experts” rather than any meaningful contribution of the public. Urban planning seeks to create systems that encapsulate life, that provide for certain ways of life, but as is pointed out, these can only be partial and are inherently ideologically driven. This critique of top-down planning models is not uniquely Utopie’s, but is repeated with ferocity and venomously directed at their bureaucratic colleagues. The conclusion of the “Logic of Urbanism” is to place urban development in context as a projective result of global Capitalism at a historical turning point. This passage situates urbanism as a specific technique or strategy in the development and expansion of Capital and explains the unique relationship that the city and its inhabitants have to the greater economic production. It does this by placing urbanism as a sub-component of modernism, and states that modernism’s goal is rapid technical development. Any negative consequences of this development are obscured by its socialization. The passage also hints at how Capital produces consumer subjectivity in its attempt to naturalize, socialize, and perpetuate itself. The combination of economic production and consumer subjectivity, both naturalized and socialized, is what is generally meant by Totality or Spectacle. At this early stage of Utopie’s output, there is not the tendency to propose alternative models for society or to directly attack the Spectacle. The role of consumer identity in the urban project is only beginning to be understood and is only hinted at in “Logic” which tends to focus on the role of specialists. “Architecture as a Theoretical Problem” was first published in March 1968 issue of Architectural Design. It was written during the build up to the May Days in Paris and served two purposes: an attack on the architectural establishment, and a defense of the growing student unrest in Paris and elsewhere. The version printed in this volume is the later, revised version of June 1968. The ideas contained in this (and the earlier essays) were the primary reason for the formation of the Utopie group: a radical critique of urbanism with a Lefebvrian understanding of urban contexts. Lefebvre along with his students developed ideas about how Capital is spatialized and how the city functions as a component and space of Capital. In its simplest formation architecture’s theoretical problem is that architecture doesn’t exist outside of social or political context of its production. Utopie forcefully points out that “Architecture as a political act that can only be that of the dominant politics.”5 Architectural production is of the Establishment—shaping the context, territory, and content of our everyday lives. It is impossible to separate it from other practices. Their critique of architectural production extends to the totalizing idea of rational-technocratic planning. Planners often believe that they can expertly design cities without acknowledging that that the more totalizing a system is, the less possible it is at seeing reality. It is blinded by the ideological bias and priorities of its creators. This critique contains a lesson in here for all the planners and urbanists who to this day uphold their self-image of benign neutrality or selflessness. Concurrently in this essay there is the begining of a critique of society transformed by consumerism or as Jean Baudrillard succinctly mentions, “The majority lives with mass produced objects that refer formally and psychologically to models with which only a minority lives.”6 Urban culture as it is expressed in consumer activity becomes the emphasis of the later parts of this essay (and many other of Utopie’s later writings). Expanding upon the earlier critiques, “A Critique of Urban Ideology” (1969) makes the important distinction between urbanism and urbanist practice and what they call urban practice. Urbanism and urbanist practice represent the consolidation of capital within the process of development through institutional actors such as politicians, the police, and developers. In contrast urban practice is defined by both the activities of daily life (the everyday) and also the potential energy towards revolutionary activity. Like the quote above, city life contains the forces that perpetuate and systematize development while paradoxically containing the potential for unpredictable foment and upheaval. Urban activity is viewed as praxis. The city itself is not neutral abstract space but is a system of activity and behaviors. The idea that a city harbors both capitalist and revolutionary impulses at the same time is crucial to conceptualizing just how complicated cities are. The evolution of Utopie’s thinking can be best illustrated in their tri-fold conception of City, “The City is at once a commodity resulting from the mode of production, the place where commodities are deployed, and the means for producing social relations as a commodity.”8 This shift in emphasis from material production (the building and capitalization of urban space) to the abstraction where people become the commodities (consumer subjectivity) is mirrored not only in the changes to the cities themselves but also in the theoretical shift that Jean Baudrillard was working through during this period. Architecture generally followed this same shifting trajectory during this time from formal object to abstracted symbol and consumer-media good. 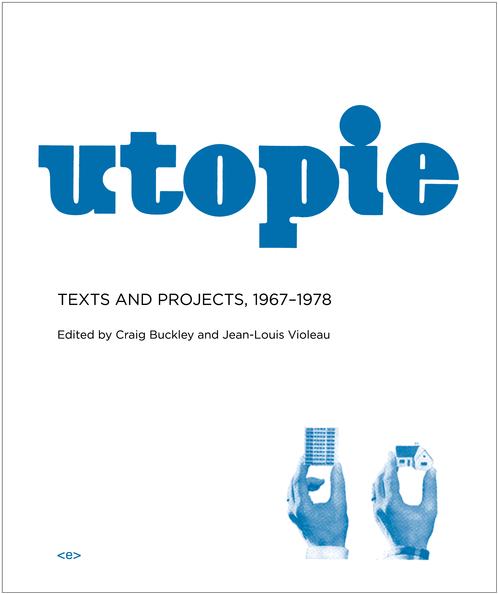 The rest of Utopie: Texts and Projects contains a selection of Utopie’s other writing, extending in many directions broadly addressing the cultural shifts that were happening: feminism, revolutionary politics, squatting, cybernetics, the avant-garde, the idea of utopia itself. Utopie No. 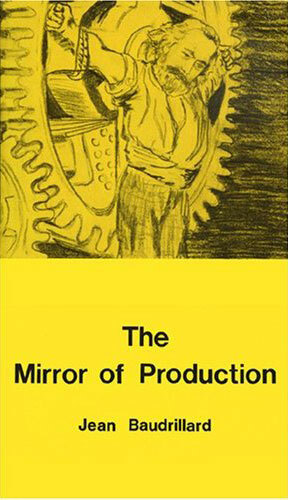 5 ( 1972) also includes an excerpt from an early draft of Jean Baudrillard’s Mirror of Production which critiques the Marxist reliance of production as the basis of labor power, which, he argues blocks more radical possibilities that lay outside of a discourse of production. Through the course of Utopie’s publication, one can trace changes in their thinking that parallels the changing ideas occurring simultaneously around the world. There is a shift from understanding capitalism as a producer and distributor of material goods into the idea that capitalism produces symbols and subjectivities. There is also a turning away from an idealistic version of architecture’s possibilities towards a more inclusive critique of architecture’s role within Capitalism. Looking back at the writings of Utopie and its surrounding global context raises the question of historical periodization. The architectural activities of this time period have been sometimes called the “Radical” period.9 The attempt to periodize the activity happening between 1965-1980 is both informative and problematic and far from universally accepted. Perioidization makes sense because of how similar ideas spontaneously emerged. Across the globe radical architects and academics appeared as a product of cultural shifts and came out of their generation’s counter-culture. Superstudio, Archigram, Utopie, Metabolists, (among others) converged on a similar critique of architectural production. On the other hand many groups and individual architects had very divergent paths when it came to how their practice and theory came together, so to call it radical architecture is a bit questionable vis-a-vis their individual relationships to production. One of the primary problems with architecture (radical or not) is that the actual practice of architecture is easily separable from its theory. Architecture’s practice is a technical and creative process circumscribed by its relation to finance and patrons. The architects in many of these radical groups become superfluous as the group moved to pure theory or critique. Utopie, like the Situationists before them, broke with their architects after a brief time, dropped much of their visual content in their publications, and moved in this purely theoretical direction, from urbanism and architecture into direct attacks on capital, culture, and commodity. On October 3rd, there is a panel discussion at Columbia University, “What is Utopia?” featuring the publishers, translators, and some of the original members and On October 4th at The Storefront for Art and Architecture will hosting a book launch event. If you are in NYC, these should be well worth attending. (1) Lefebvre, Henri.“From Urban Science to Urban Strategy.” in Utopie:Texts and Projects.